Elizabeth I has acceded to the throne of England, a position she has waited and schemed for all her life. She is surrounded by advisers, all convinced that a young woman cannot form political judgements. Elizabeth feels that she can rely on just one man: her oldest friend, Robert Dudley. It is soon plain that he is more than merely a friend. In a house in the countryside waits a very different woman, Amy Robsart - Robert's wife. She has no taste for life at court and longs for the day when her husband will return home. She has loved him since she was a girl, but now they are adults she hardly sees him. Meanwhile, the pressure grows for Elizabeth to marry, for it is unthinkable that a queen should rule on her own. Elizabeth's preference is clear, but he is unavailable. But what if the unthinkable were to happen! Unlike the previous historical novels by Gregory that I’ve read, The Virgin’s Lover isn’t written in the first person, making this story feel slightly less personal than either The Other Boleyn Girl or The Queen’s Fool, however, it enables the reader to look into the minds of more than one character at any given time and know exactly what plots are being hatched. It paints a more vulnerable picture of Elizabeth I and she is shown as a woman with loves, hopes and fears like any other, but a woman in a position that will not allow her to be like any other – she can’t just be a Queen, she must rule like a King, with a decisive manner and firm hand. However, the portrayal is not always sympathetic; her selfish, demanding side is given free reign and she often manipulative and impulsive, as well as malleable; in shirt, she’s a flawed human being. The ambition often associated with Elizabeth, one of the most powerful women in history, is matched by that of her lover, Robert Dudley, and his ruthlessness in working to raise his position so that he can make a play for the throne. 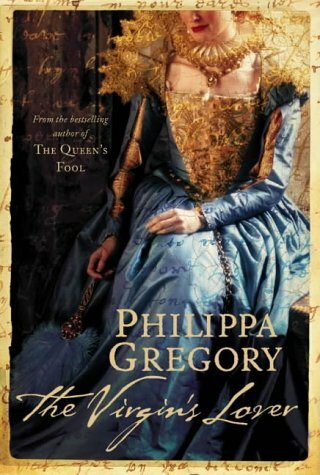 The Virgin’s Lover shows the cutthroat world of Tudor politics alongside one of the most famous royal romances England has ever known and throws the reader into a dizzying whirlwind of love and treachery in Gregory’s own imitable style.